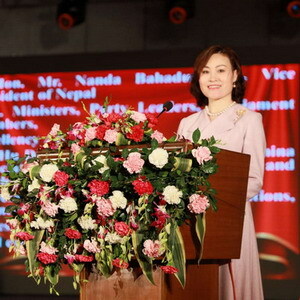 Her Excellency Ms. Hou Yanqi, new ambassador of the People's Republic of China to Nepal, held reception of The Chinese New Year and Ambassador's arrival on the evening of January 30th , 2019. Rt. Hon. Mr. Pun, Vice-President of Nepal, Hon. Mr. Mahara, Speaker of the House of Representative of Nepal, Hon. Mr. Timilsina, Chairman of the National Assembly of Nepal, Hon. Mr. Yadav, Deputy Prime Minister and Minister for Health and Population as well as multiple ministers, Hon. Mr Kharel, Attorney General of Nepal, Hon. Mr. Khanal, Member of Central Secretariat of NCP and Former Prime Minister, Hon. 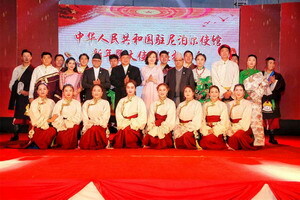 Mr. Deuba, President of Nepal Congress and Former Prime Minister, Gen. Thapa, Chief of Army Stuff of Nepal Army, Nepali friends of various sectors, members of the Diplomatic Corps, Chinese companies in Nepal, representatives of the Chinese community and other guests attended the reception.